What's not to love about Valentine's day? The rom-coms, the deliciously themed chocolate, the flutter of romance in the air. Whether I'm flying solo or in a relationship, it's definitely my favourite superfluous holiday. I especially love love themed products. Paul & Joe always get me with their packaging. Of course the quality of their products is great, too. I especially love these blush pots. The packaging is adorable and the engraved love birds call to the inner hopeless romantic in me. Aside from the cute packaging, this is actually a lovely blush. The three colours can be used individually or all together for a pretty (shimmery) pink / peach glow. It sort of reminds me of Benefit Sugarbomb, but with more shimmer & a little more pigmentation. I really like these lipsticks, from the formula to the available shades. I also love the packaging, I find the silver cases kind of romantic. I change my phone case probably as often as I change my shirt, so why not have a specially themed one? I always find the coolest (and most unexpected) things at Urban Outfitters. Instead of wearing your heart on your sleeve, how about wearing your heart on your nails? This is a quick and easy way to spice up your polish. No steady hand required. Have you ever smelled Jo Malone's fragrances? No? I recommend you do so immediately! They smell divine. 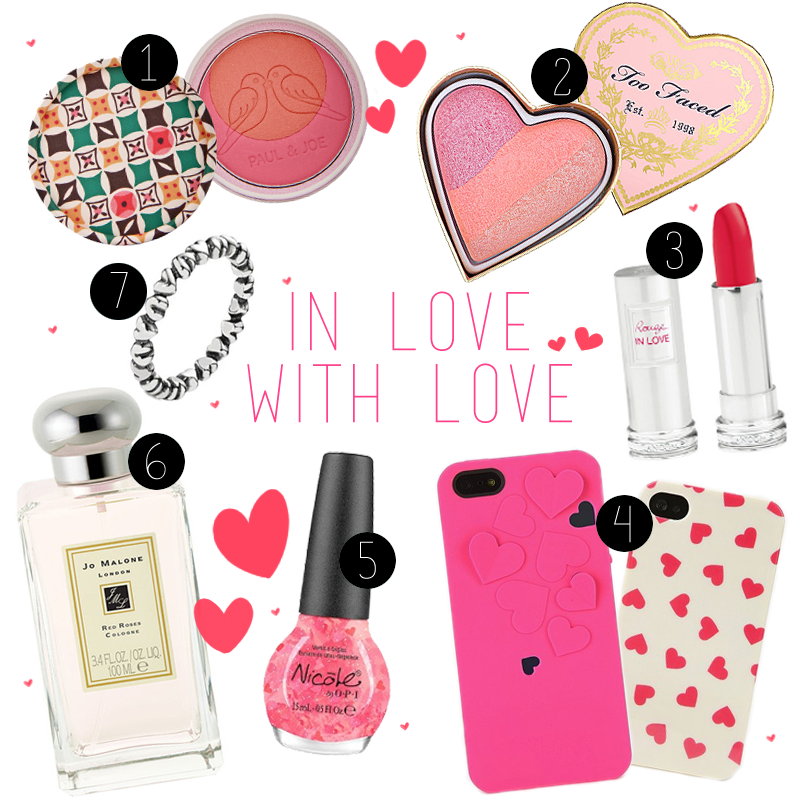 My favourite is Nectarine Blossom, but I think Red Roses is a perfect fit for the day of love. I owned this ring once. I say "once" because I lost it a few months ago. I am definitely going to repurchase though because a) it's a great ring to wear alone or to layer with, and b) it's cute! I love that O.P.I polish however, I find it hard to actually get the hearts on your nail. I have never heard of that blush brand before, the packaging is gorgeous! The Two Faced Flush Blush looks so sweet. I like the heart phone case too. I love love-themed products as well, especially those with hearts! I want the Too Faced blush!